Having established ourselves here on the Kona side of Hawaii, we figured it is time to actually show you around! 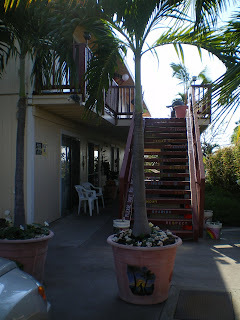 We are staying at a local hostel, smack dab in the middle of the town of Kailua-Kona. In exchange for work on property improvement projects, we are given a room and a place amongst the staff of the hostel. (Note: interested in learning how to get free accommodation gigs like this? Check this out: How to Get Free Accommodation Around the World). The perks are many: we have unlimited high-speed internet and wireless access, flexible hours, the amenities of the hostel at our fingertips (including free laundry, BBQ, and housekeeping services) and amazing camaraderie and generosity of fellow house-mates. There are four other staff members, and we share a bathroom and kitchen with them. It can get pretty crowded at times, but it is surprisingly workable so far. The property is environmentally friendly, as they truly adhere to the principals of reusing and recycling. Guests are strongly encouraged to comply as well, and it is made easy for them to do so. Our “work” projects to date have been varied. Our recently acquired green thumbs and Hawaii-horticultural knowledge is being put to use with lots of gardening and large-scale landscaping chores on Kelly’s part. The property has fruit trees, wildflower patches, ginger seedlings, herb gardens, and Koa trees, all of which need some TLC being provided by Kelly. His handy skills have also been put to use with speaker repairs, plumbing jobs, and carpentry tasks. I on the other hand, am not so much a handy person, and my skills acquired on the other side of Hawaii were more around milking goats than fostering agriculture. Since there aren’t any goats around for me to tend to, my existing creative and administrative skills are being put to use. I started by painting signs and stencils (as well as doing some small patch work and appliance touch-ups), where I got used to the feel of acrylic paints. Somehow the projects escalated to the point where I found myself painting full-on Hawaiian landscape scenes on large palm tree planters located at the front of the property. I figured I was okay with a paintbrush, but I truly surprised myself with the results. And to be playing with paints a few hours a day in return for a place to stay – what a gig! Some of the artwork I have had a chance to do – the sunset beauty is my pride & joy. Beyond that, my administrative and business analysis muscles will soon be flexed by helping the manager with some “big picture” projects. When we’re not working (and we don’t work much! ), we are enjoying the sunny side of Hawaii. We haven’t seen a drop of rain yet, which suits our water-logged Hawaiian history just fine. Trips to the beach to go boogie boarding, snorkelling, fishing and spearfishing have been plentiful. We also enjoy the local farmer’s market (open 5 days/week), walks in the area (which has about everything we need), and relaxing in some of the many quiet oases on the property. Between the hammocks, fish pond, artificial black sand beach, rocking chairs, and inside office, we have many places to carve out a niche and settle in with a good book or work on laptops. There is always some gentle reggae playing, which although I wasn’t previously a huge fan of reggae, has grown on me quite nicely. Welcome to our Hawaiian paradise! Hmm I was very intrigued by your story and read almost your whole blog quickly, like a book. Hi Martin – great questions! We were indeed going to stay in the other location for 6 months, but a number of factors resulted in our decision to leave, not the least of which was the weather – it rained every single day for a month straight (no exaggeration: it made the newspapers)! The problem with all that rain meant no power either, and no internet – which I need to make my meager living. Trips 11 miles by hiking/hitch hiking into the nearest town became expensive and prohibitive. And yes – a bit of cabin fever, and a feeling of being very remote also hit home, but were by no means our ultimate reasons for leaving. In fact – we miss many things about that place, and will certainly seek out further permaculture or agricultural positions in the future. Being so incredibly in touch with nature was wonderful, we learned so much, and became considerably healthier and environmentally conscious in the process. I would still go back to Hawaii next year. It’s a great experience to travel around Hawaii! Glad to know my works of art(?) are still alive and well. Hopefully the hostel still has the cool vibe – which made it what it was. I hope Myrtle Beach is nice and warm and that you’re enjoying the Atlantic breezes instead of the Pacific ones. I am planning my round the world trip the summer of 2015. I will be 60 and retired. Do you have any advice or information for someone my age for volunteer and get accomodations for “free” type of situation? Awesome! Volunteer and various free accommodation options vary dramatically, depending on what you want to do and where you are traveling. My suggestion would be to look around for an opportunity that you like the look of, and as with any volunteer position, be sure to ask lots of questions before you go. I would love to volunteer (helping to run hotel, hostel, F&B. Or do marketing/sales or business related jobs) in return for free accommodation. Currently I’m on my sabbatical and working on my business plan..so I could help out around 20 to 30 hours a week, and in the spare time to work on my business plan and explore a new place! Let me know if there is something available in Kona, Hawaii! I’m not a resource for gigs in Kona per se, having only volunteered at KOA Wood Hale. (You can always contact them directly to see if they still operate that way). The two gigs I found in Hawaii were from the Caretaker Gazette (www.caretaker.org) – which tends to have a fair few Hawaiian gigs in their listings, and Grow Food (www.growfood.org).